MrOwl is a new platform that makes it easy for teachers to search for online resources and save them, upload photos and documents, organize resources by topic, share them with others, and so much more! 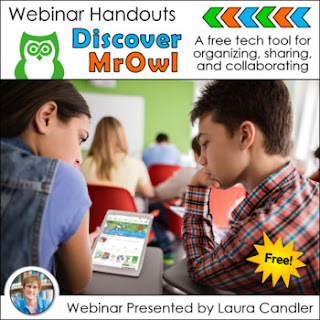 On January 30th, at 8 pm ET, I'll be presenting Discover MrOwl: A Free Tech Tool for Organizing, Sharing, and Collaborating, a free live webinar to introduce MrOwl to educators. A free professional development certificate will be made available to all attendees at the completion of the webinar. If you'd like to learn more, download this note-taking outline to see exactly what I'll cover during this webinar. As you can see from the handouts, I'll explain what you can do with MrOwl, how it's organized, and how to get started using this free technology tool. We'll explore the many unique features of the MrOwl platform, including how to use MrOwl both professionally and with your students. Register for the Next Live Presentation of Discover MrOwl! Click the link below to visit the webinar registration page on Teaching Resources. From that page you can sign up for the next live presentation of Discover MrOwl, or register for the replay if you miss the live event. -->> Discover MrOwl: A Free Tech Tool for Organizing, Sharing, and Collaborating. • To be notified by TpT when Laura adds new items, click the green star above. • Click HERE to sign up for product updates and exclusive freebies!